Commemoration services for major battles and other important events were generally low key until the time of the 50th commemorations beginning in about 1990. Although services had been held in Wellington and other centres in New Zealand, any services held at overseas war cemeteries were small scale and dependent on visitors making their own arrangements to attend. The 50th commemorations were a time for major events, with groups of veterans being invited to attend services at Crete, El Alamein, Cassino and VJ Day in London. The government of the day contributed towards the veteran's costs of travel and accommodation, but each veteran had to pay several thousand dollars to attend. And then, after the 50th commemoration services, the government decided that veterans would be entited to only one subsidised trip. Only after the trip to Crete in 2011 was this policy rescinded, by which time most veterans who might have become eligible were not in good health, or had passed away. I do not have information related to all of these commemorations, but perhaps other people have photographs, programmes and other information, especially related to the 50th services for Crete and El Alamein that could be shared here. The Battle of Crete in 1941 saw a depleted Allied force comprised mostly of the Australians and New Zealanders who had just been evacuated from Greece. It was a fierce battle, famous for the large-scale parachute invasion and the subsequent high casualty rate. I attended the 75th services on Crete in 2016. This is my photo-diary of the event. The Crete Services in 2016. 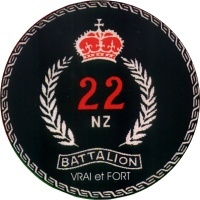 The Battle for Cassino featured large in the history of the 22 Battalion as it did for all of the New Zealand Division in Italy. Over the years it has become one of the principal commemoration events. The 22nd Battalion captured in photographs from 1944. This was the first major commemoration event at Cassino. A commemoration plaque was laid at the Cassino Railway Station and two pohutukawa trees were planted behind the Cross of Sacrifice at the Cassino War Cemetery. The 22nd Battalion at Cassino in 1994. Another group of veterans were taken to Cassino for the service in 2004. A large group also travelled privately to join the service, some of whom had attended the 1994 event. The 22nd Battalion at Cassino in 2004. This was another major commemoration event at Cassino. A second plaque was unveiled at the Cassino Railway Station. The number of veterans had reduced to 40 and only a few of these had been in Cassino in 1944. The 22 Battalion was represented by two veterans and two families of veterans who had been in the Cassino battles. The 22nd Battalion at Cassino in 2014. The Battle of El Alamein in 1942 was the turning point in the war and it saw the New Zealand Division featuring large in its success. A small New Zealand contingent attended the 50th commemorations in 1992. I attended the 70th service in 2012. This is my photo-diary of the event. The El Alamein Service in 2012. Elements of the 22nd, led by the Commanding Officer LTCOL Haddon Donald, were the first Allied troops to enter the Italian city of Trieste on 2 May 1945. Details of the event are recorded here. In May 2005 a 60th Reunion trip was undertaken by 24 members of the Battalion, along with other men and their families. A detailed account of the trip is recorded here. An account of the trip is recorded here. Not strictly a 22 Battalion event, but during 2007 the Prime Minister the Hon Helen Clark announced an official commemoration service for the 90th anniversary of New Zealand's involvement in the Battle of Passchendale. The plan was to take a small number of veterans on the trip, those who had some family connection with the battle or more generally with the Western Front. Ten veterans were accepted for the tour, with only two - one being Doug Froggatt - representing WWII veterans. This is his story and photos of the event. Doug Froggatt at Passchendale 2007.